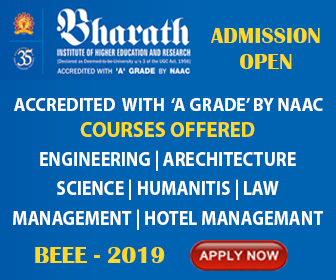 KEE 2019 Karunya Entrance Examination - The Application form for KEE 2019 has been released for admission to all UG courses of Engineering, Science and Arts of Karunya University for the academic session 2019. The Karunya Institute of Technology and Sciences will conduct All India Karunya Entrance Examination (KEE) for admission to B.Tech, B.Sc Agriculture and B.Sc Horticulture Courses only. However Provisional admission can be done from 08th October 2018. The admission will be confirmed to a candidate after receiving his/her original certificates as per the eligibility norms of the Institution. The Karunya Institute of Technology and Sciences offers admission in various UG, PG, Lateral and Diploma courses. However, through KEE 2019, candidates will get admission in the following courses. The candidate should have passed Intermediate/ Class 12th in PCM/ PCMB/ PCB/ PC (Forestry)/ Inter (Agriculture) from a recognized Board/ University and should have secured a minimum aggregate of 50% marks. The admission will be confirmed to a candidate after receiving his / her original certificates as per the eligibility norms of the Institution. The candidates can log on to https://admissions.karunya.edu and submit his/her expression of interest (EOI) online about the course he/she would like to pursue at Karunya Institute of Technology and Sciences.